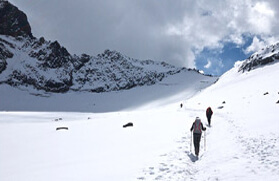 Twin Kailash Trek incorporates exploring two mountain peaks i.e. Kinner Kailash and Shrikhand Mahadev Kailash. 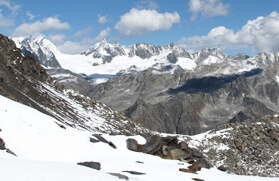 These peaks are among the Panch Kailashes. 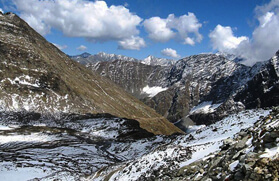 Mount Kinner Kailash is positioned in the Kinnaur Valley in Himachal Pradesh. This place is believed to be the abode of Lord Shiva. In earlier times, the circumblation of this spiritual destination was of 200 kilometres, which was later shortened. The area offers a wonderful introduction of merger of Buddhism and Hinduism. The shrines of Baspa Valley are matchless examples of Pagoda architecture. Mount Shrikhand Mahadev Kailas is positioned at an altitude of 5155 meters and it resembles to the Shivling. 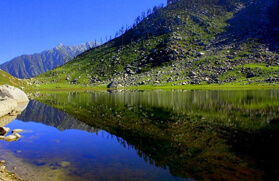 As per the legends, Lord Shiva meditated on this mountain and Pandavas visited here once. 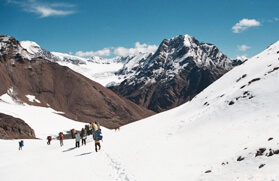 One has to cross few beautiful glaciers in order to reach this imposing region. 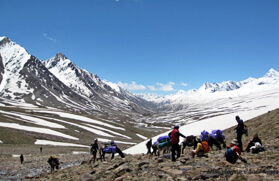 This 15 nights and 16 days itinerary takes the travelers to an engrossing and congenial trip to Twin Kailash Trek. 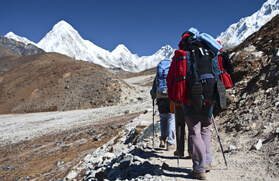 The trail allows the trekkers to relish bountiful beauty of nature. Adventurers can get drenched in unsurpassed exquisiteness of nature along with serene spirituality. In the morning drive to Shimla via Karnal and Solan. On arrival at Shimla check in to hotel, later roam on world famous Mall Road. Dinner and overnight stay at hotel. In the morning after breakfast, we will be leaving from Shimla to Kalpa via car and covering a distance of about 220 kms. 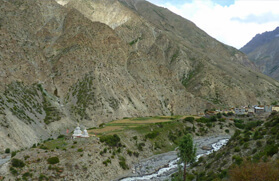 On reaching Kalpa, check into the pre booked hotel for enjoying an overnight stay. After breakfast in the morning, we will be moving ahead from Kalpa to Tangling Village. On reaching Tangling Village, a small and a beautiful village, fix the camp. Rest of the day is free for acclimatization and exploring the hidden beauty of the village. Enjoy an overnight stay in the camp in Tangling Village. In the morning after breakfast, we will be leaving the Tangling Village and start our trek of about 7 kms to reach Parvati Park. 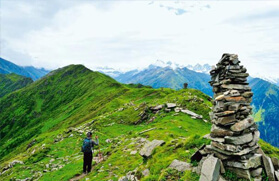 While trekking enjoy the scenic beauty of the mountains. On reaching Parvati Park, we will set the camp for an overnight stay. Today, we will cover a trekking distance of about 5 km. We will start our trekking from Parvati Park and walk to Ganesh Park. The trek will leave you with a unforgettable experience of walking over the hill. Enjoy an overnight stay in the camp at Ganesh Park. In the morning after enjoying a delicious breakfast, we will again be prepared for another trekking experience. We will leave Ganesh Park / Cave and trek to Kinner Shivling, which is again about 5 kms walk. Thereafter, we will return back to your camp in Ganesh Park / Cave for a relaxing overnight stay. After breakfast in the morning, we will leave from Ganesh Park and walk towards Tangling. 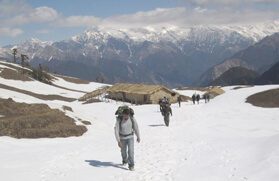 It will be a 12 kms trek and will give a mesmerizing trekking experience. On reaching Tangling, we will set up a camp for an overnight stay. Today in the morning, we will leave Tangling and proceed towards Rampur and thereafter to Jaon via Taxi. On arrival in Jaon, check in to the hotel for an overnight stay. The day is free for leisure and for acclimatisation in Jaon. An overnight stay in the hotel. In the morning after breakfast, we will be leaving for 13 Meel, which involves 9 kms of trekking distance. On reaching 13 Meel, set a camp for an overnight stay. After breakfast today in the morning, we will move ahead to Bhim Talai from 13 Meel. The whole journey will include about 9 kms of walk. Thereafter, on reaching Bhim Talai, we will set a camp for an overnight stay. Today, we will leave from Bhim Talai in the morning and trek to reach Parvati Bagh, which is 8 km away. 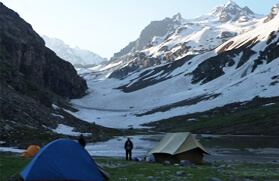 On reaching Parvati Bagh, enjoy a relaxing overnight stay at the camp set in Parvati Bagh. After having breakfast in the morning, we will leave from Parvati Bagh and move towards Shrikhand Mahadev and thereafter towards Bhim Dawari, which is together comprise of about 12 kms walk. On reaching Bhim Dawari, enjoy an overnight stay in the camp. Today in the morning after breakfast, we will trek towards Thachdu from Bhim Dawari and cover a distance of about 12 kms. On reaching Thachdu, have dinner followed by an overnight stay in the camp. In the morning after breakfast, we will be leaving from Thachdu and have an incredible trekking experience of 14 kms to Jaon. On arrival in Jaon, check into the hotel for a night stay. On the last day of our tour, we will be leaving from Jaon in the morning for Shimla and then take night AC Volvo coach for Delhi at 22:00 hrs. Overnight journey. Arrival at Delhi by morning in between 06:30 - 07:00 hrs.